The Floyd Wallace Crosby families were prolific letter writers. The cast of characters and their relationships are illustrated above in the formal family tree. 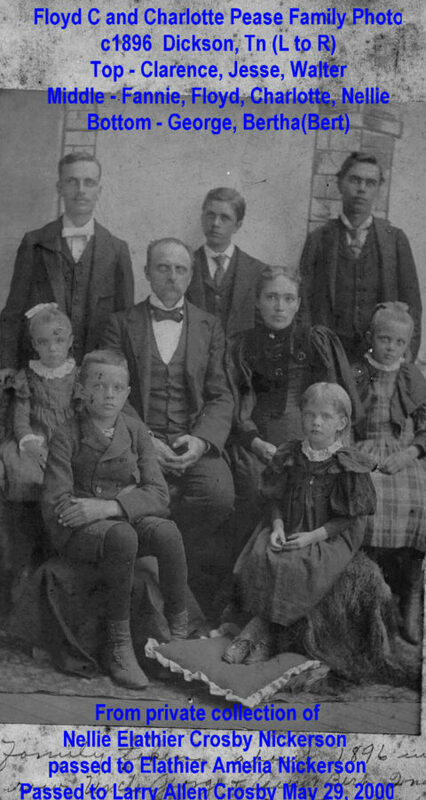 The image to the right is the Crosby family in Dickson, TN in 1896, just prior to their involvement in Cuba. These letters are listed in the chart below, and they really tell the day to day trials and tribulations of the family members. They also tell of larger world events and how they impacted the family at the personal level. For example, the 1919 flu epidemic had a profound impact on the George Francis Crosby Family. Disease and death in Cuba had a profound impact on the Clarence Wallace Crosby Family. Most of these letters were preserved by Jesse N. Crosby, who stored them in Cuba, and brought them back to the Main Land. These were in the possession of Lula Crosby Keyes, who passed them on to Larry Crosby in 2000. Note that many of these letters are over 100 years old. To Sort each column - click to reverse the sort for each column. If you would like to double sort, click the first column, and then shift click on the arrow for the second column. To Search - just enter any word or combination of words to find a single document or list of documents which contain the word or phrase used in the search. To return to the full list, delete everything in the Search Box. To read the letter - click on the red date. 1909-01-13 Crosby, Jesse N. Dickson, TN Crosby, Floyd W. Bartle, Cuba new stack for boiler, work slack, balanced ledger accounts, HW Lumber, Magie falling out w Lula, Jesse wants out of business, Fannie's pictures, FW Crosby reply at bottom of letter. 1916-12-18 Crosby, Floyd W. Galena, IL Crosby, Jesse N. Bartle, Cuba Anson's treatment, head aches & feet problems, do not enjoy cold weather, living expenses fierce here, limberger cheese so high, all girls here Sat nite before Xmas, doing truck repair work, Clarence, realize that our best working days are past - feet. 1918-04-19 Crosby, Floyd W. Toluca, MT Crosby, Jesse N. Bartle, Cuba Quartered in 12x14 Shack, Quite Cozy, Bertha Stayed in Billings, Bertha done with Course, Bertha Make Her Own Way Now, Anson, Build 16x22 Shack for George, George Family Got Measles - delayed Arrival, Wheat Looks Good, Charlotte wants to go to Cuba, Does not Want To Be Away from Girls, I could not hold down job in mill. 1952-12-25 McCleskey, Fannie F. Sheffield, AL Crosby, Jesse N. Bartle, Cuba Nellie, Elathier, Sanford, Joe, Fern Austin & Buddy Rogers here for xmas, Floyd & Lexie visit, Agnus not here this year, Where is family letter? 1938-11-25 Crosby, Clarence W. Chicago, IL Crosby, Jesse N. Bartle, Cuba 22nd Anniversary of Teresa's Passing, Miss Her, Allen Married a Year Ago Today, Has Very Nice Young Wife, Both Working in Waukegan, Xmas Get Together?, Waiting for Family Letter, Missionary Effort in Cuba, Your New Wife Does Not Have A Workable Knowledge of English? 1933-10-28 Crosby, Clarence W. Zion, IL Crosby, Jesse N. Bartle, Cuba "Cannot possibly understand that you have any honor or duty ... to getting away from there"